Fax for Apptimo is a cleverly implemented add-on service for Activity. It allows to receive faxes directly in your Inbox without the need of a fax machine, whether you are working or traveling. This fax service is so convenient and inexpensive that it would make using Activity for Apptimo the sole reason for it. You get a fax number assigned to your Apptimo ID account. 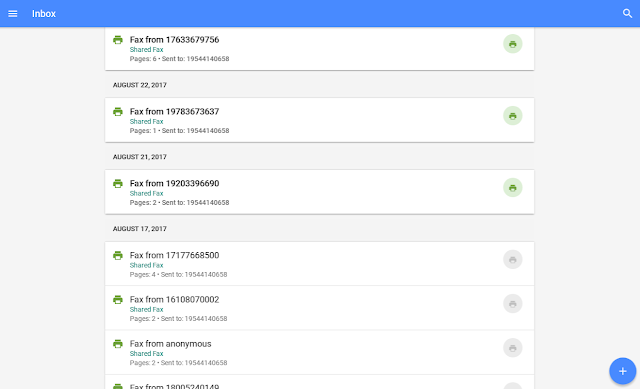 You can get multiple fax numbers on your account (I will explain it later) as wells as fax numbers from different cities in the world. You pay a flat monthly rate for each number for unlimited incoming faxes. A fax number from the US is $ 8.50 per month. You can get fax numbers from Argentina, Brazil, Canada, Colombia, France, Germany, Italy, Mexico, Panama, Spain, United Kingdom, United States, as well as from other cities (you can see a complete list here).